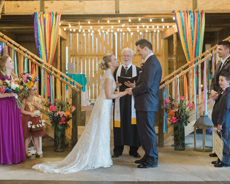 Laura and Patrick exchanged vows on May 7, 2016, in Brinkley, Arkansas, at the Medford family’s southern farm home. 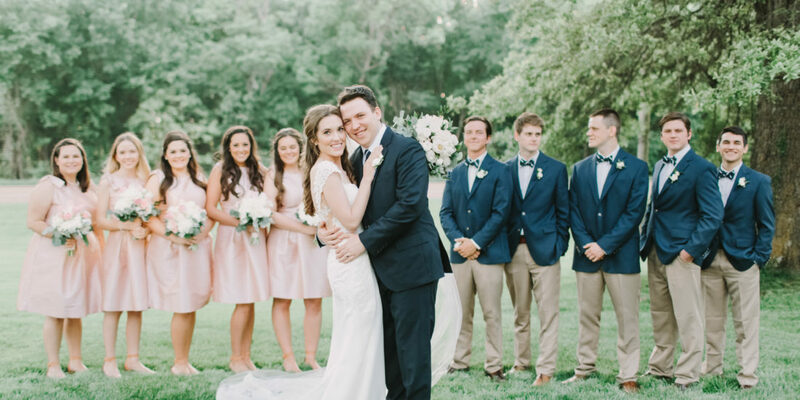 The family farm was the perfect setting for a wedding as all of the couple’s family and friends gathered together to celebrate this special day. Laura got her hair and makeup done with her sisters, mom, and bridesmaids at her side. There was something really special about Laura getting ready for her wedding in her old childhood bedroom surrounded by old family photos and memorabilia from her childhood. All throughout the house were reminders of the close bond they all shared. You could almost imagine the four sisters playing house in the pink-shuttered playhouse that still stood on the property. There wasn’t a dry eye in the room when Laura exchanged letters with her father before the ceremony. 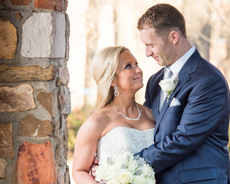 The bride’s vintage-inspired lace gown looked absolutely stunning on her as her mom helped fasten the dress. Patrick got ready with his groomsmen downstairs and looked quite dapper himself. 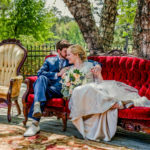 The couple had photos taken out on the lawn by the very talented husband and wife duo of Christopher & Nancy Weddings who photographed all of the special moments of the day. See all the wonderful photos here! Chairs were set up on the back lawn awaiting guests for the ceremony. The southern farm was a beautiful backdrop behind the alter that was made up of greenery, hydrangeas, and pink and ivory roses. Laura was accompanied by her father down the aisle as Patrick got his first glimpse of his beautiful bride. Emotion-filled vows were said and the couple was then pronounced husband and wife. The reception was on the Medford’s property and everyone had a great evening. Green topiaries with string lights hung over long, wooden farmhouse tables creating a very natural setting and providing plenty of seating for guests. Pink and ivory flowers adorned tabletops and dangled from chandeliers. The wedding coordinator, Ann-Claire Allen Planning and Design, made sure the day went according to plans. The awesome band, Memphis Soul Review, supplied the music and kept everyone dancing all night long. The newlyweds were introduced and shared their first dance together to the song “This Will Be.” Laura had a special dance with her father to the song “My Girl” and Patrick shared a dance with his mother to “In My Life.” The band gave Laura and Patrick a chance to sing to each other, and they were pretty good! Southern fried chicken and all of the fixings was served for dinner and did not disappoint. Everyone felt like kids again when the Loblolly Creamery ice-cream truck pulled up and parked for the night. Sentimental speeches were given by the father of the bride and the sister of the bride, Emily, who exclaimed their love for the couple and wished them the best. Stars lit up the night sky, and a sparkler exit lit up the Medford’s front yard as the couple kissed in celebration and the night came to an end. Sunflower films enjoyed shooting Laura and Patrick’s wedding and creating their wedding film. It was a pleasure working with them and the entire Medford family. 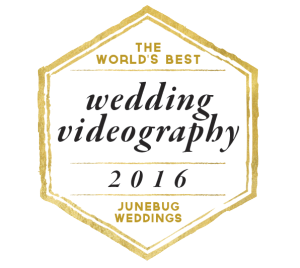 From the Knot: Thinking of Cutting Video? Read this first.